Here you can find all information about the cannabis breeder B-dub Genetics. We've collected data about 7 Cannabis Strains breed by B-dub Genetics. Click on the strains to find more informations, pictures, reviews, comparisons and sources for a variety - and/or check out the Breeder Info here at the page to find out more about B-dub Genetics. Its also possible to visualize all B-dub Genetics strains together with all their Parents or Hybrids with our dynamic maps - check it out! Click here to visualize all B-dub Genetics strains including all known hybrids and descendants with our dynamic map! Here you can watch all B-dub Genetics strains and their ancestors (sorted by origin) with our dynamic strain map! 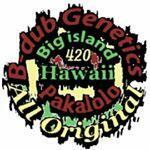 B-dub genetics focuses on exotic / rare strains made in Hawaii , Carefully grown , selected , bred and tested with love and aloha on the big island of Hawaii. , "Spreading aloha to gardens everywhere one bean at a time"